I’ve been thinking a lot about this important if long Medium post by James Bridle regarding the nonsensical and potentially damaging kids content on YouTube. In it he moves from video to video, finding stranger and stranger examples. Further, an exodus of advertising is hitting the service as some disgusting comments were found below videos aimed at kids and of kids. Strangers with various motives are watching all of these videos for various reasons and that’s not OK. Even if one child enjoys one nursery rhyme, there is so much content that is both ridiculous and dangerous lurking under the surface of the service that you’re almost guaranteed to step on a content landmine. In short, YouTube is not for kids. As a parent, this is important and obvious. Chances are you’ve let your children watch something on YouTube just to keep them amused. If you haven’t done this then you have my admiration but YouTube has become a babysitter and playmate and TV channel. It is trivial to snake through the YouTube rabbit hole and find content that is violent, weird, and insanely popular. Start here, with a search for Cars. This is a search my eight-year-old son has figured out by himself. Next we pick a video (any video) that isn’t a toy unboxing (a genre of kids content that is also wildly popular) we find an animated short of trucks flying into space. It got 1,379,902 views, presumably by kids simply playing it over and over again. Take it one more step and the cars begin exploding and Spider-Man is inexplicably involved. We conclude our sojourn with an unboxing video featuring kids opening toys. It has 3,404,989 views. Childhood education is a long and tricky process. It requires passing along body of knowledge that will allow a human being to exist among other human beings and, while the details change, the story is still the same: we want to ensure our are kids happy, healthy, and smart. Kid’s entertainment requires story and, hopefully, logic, lessons, and learning. This means Spider-Man and Elsa probably shouldn’t be losing their mouths in a wacky mixup video. YouTube is a cesspool of garbage kids content created by what seems to be a sentient, angry AI bent on teaching our kids that collectible toys are the road to happiness. YouTube isn’t for kids. If you give it to kids they will find themselves watching something that is completely nonsensical or something violent or something sexual. It’s inevitable. 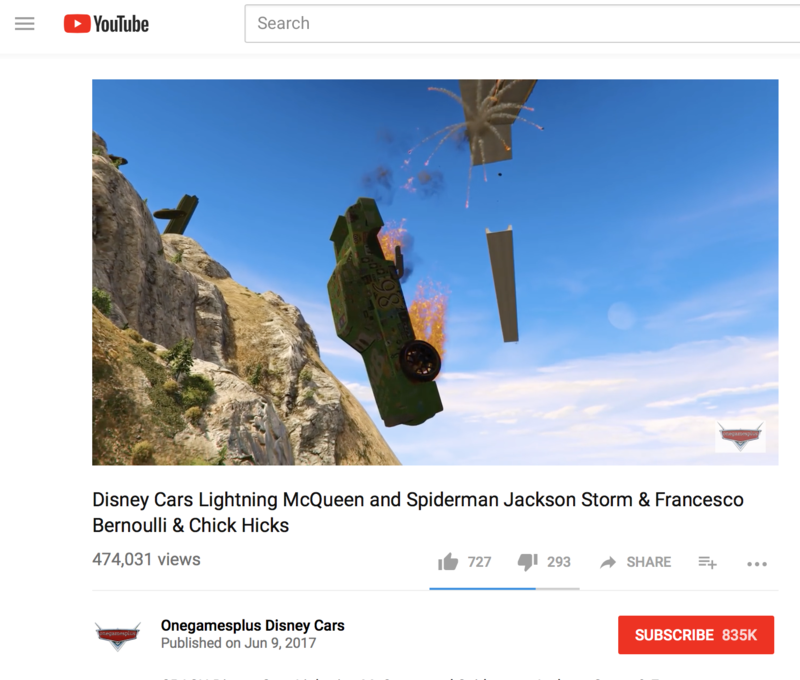 YouTube can add kids channels, scanning services, and even human censors but trust me: your four year old is eventually going to hit stuff like this. This is not unsupervised play. This is a dangerous addiction. I don’t want to spoil your brunch, fellow parents. Maybe there are great videos on YouTube that you’ve found and maybe your child doesn’t click into the black hole every time they sit with your phone. But there is a body of animated content out there with story, wonderful characters, and true messages of peace, love and understanding and it probably costs a few dollars to download. You wouldn’t feed them food given to you by some random person on the street. Why would you give them videos by someone with an eye on monetizing their eyeballs?